Emotion can be conveyed in a multitude of ways, but it always seems to be the eyes that are recognized first. Big Eyes tells the true story of American artist Margaret Ulbrich (Amy Adams), who in 1958 leaves her husband and decides to start life anew with her daughter and her paintings, most of them featuring people with big eyes. Mother and daughter are now rejuvenated in North Beach, San Francisco, a progressive place and an artist’s dream for someone of Margaret’s caliber. 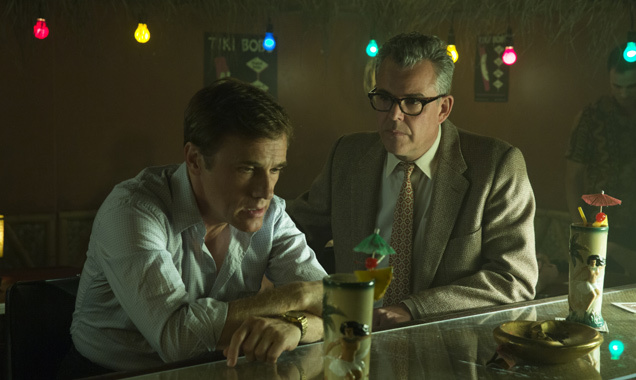 A companion is needed though, and Margaret finds it shortly in the form of smooth-talking Walter Keane (Christoph Waltz), also a passionate artist. Walter not only serves as a partner, but also the only thing that could keep her daughter Jane in her possession. They end up getting married, and things appear to be a perfect blend. With Walter, the new Mrs. Keane starts getting the money she deserves for her work, but it comes with a price: No one knows it is her creating the paintings, as Mr. Keane, a guilty conscious absent from his mind, willingly takes all credit. For what seems like forever now, the mention of director Tim Burton’s name invokes images of dark, odd, out-there scenery and characters, be it of the animated or live-action variety. In no way has yours truly seen every work in his filmography, but in recent years it does feel that if you’ve seen one of Burton’s films, you have sort of seen them all, especially as Johnny Depp and Helena Bonham Carter are present in about every last one of them. Big Eyes, sans Depp and Bonham Carter, represents an entertaining, well-made, grounded, and mature effort to a feature film from a man who many doubted if he had it in him. A more traditional directorial effort doesn’t mean that Burton completely abandons his trademark style. It is still found here in places, but the style isn’t a crutch for the movie. Those infrequent instances that are vivid and surreal with vibrant color tones and quirky imagery highlight these moments more, showing off the artistic element (technical-wise and script-wise) of the movie, and giving them more importance in comparison to past works which featured the same stuff throughout. Maybe all it took was a true story. There is a notable level of respect that Burton conveys with this effort. I had never heard of Margaret Keane, but her tale is legitimately interesting, and he (Burton) lets the story plays out naturally for the most part. The social commentary regarding women and whether the public fully accepts their work or contributions isn’t heavy-handed, but it is thought-provoking, and still matters today. However, even at a pretty standard 105 minutes, the movie is overlong from time to time. Not to discredit anyone else who appears here, but after Burton’s direction, Big Eyes boils down to two people and performances: Amy Adams as Mrs. Keane and Christoph Waltz as Mr. Keane. Both are veterans and immensely talented, and reaffirm that again in this. For a movie with a focus on eyes, Amy Adams knows how to utilize hers. Her attempt at a Southern accent may come and go, but those eyes remain. There are many scenes in which she fully exhibits the sadness and worthless feeling her character is subject to by Walter. Still, not a ton is known about Margaret, but it can be assumed that this isn’t the aim of the movie. There might not be enough character-wise for serious award “contendership” but the performance is very, very sound. If Adams’ character work is unassuming here, her counterpart Christoph Waltz’s portrayal is anything but. His character revels in the spotlight, addicted to the glamour and acclaim, all style in his exterior and little substance behind his interior. Waltz looks to know this, presenting the audience with an animated and spirited portrayal of Margaret’s husband. While it does feel very over-the-top especially near the end, apparently this was exactly how Walter was in real life according to the real Margaret Keane, who served as an adviser of sorts. If that is the case, then Waltz certainly does a spot-on job, but that doesn’t change the fact that it can become quite comedic. It would have been very easy for Burton, especially with the source material, to make Big Eyes in the same motif as previous features. But the proverbial comfort zone is left, or at least pared down substantially, and a great movie exists as a result. Perhaps this will open up his eyes a bit; not every feature needs to be a fantasy. Photo credits go to variety.com, contactmusic.com, and screenrant.com. It really was a pleasant surprise. Can’t wait to see your thoughts on it. I just don’t know what to make of this movie. I haven’t seen it, but it intrigues me. Now YOU give it an A-. Hmmm. It’s on my list now. Nice to know I might be THAT guy lol. Seriously, I’ve heard reviews saying this is meh, but it truly surprised me. 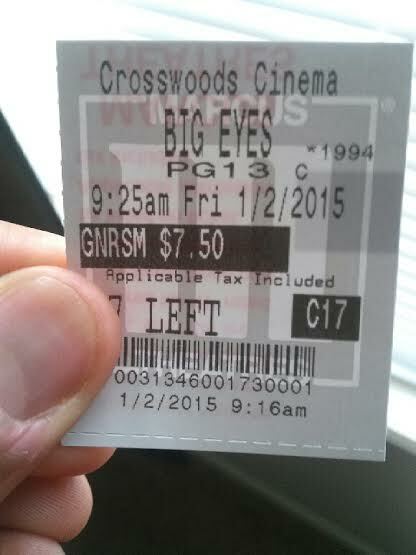 Out of the Christmas movies I’ve seen recently (Imitation Game, The Gambler, this, didn’t get to see Unbroken or Into the Woods yet), Big Eyes is easily my personal favorite. Hope you enjoy. Imitation Game is another I have to watch! The list grows! Really liked this one! Great performances, and really enjoyable throughout. Some people have criticized it as not going deep enough, but I think these types of movies are a breath of fresh air; it raises interesting questions, but it doesn’t need to have some *Big Theme* to be a good movie. Great review Jackson. I really enjoyed this and believe it’s Tim Burton’s best live action film in a while. It definitely makes up for Dark Shadows! Adams and Waltz are both on fine form too. I especially liked how the film opened up during the court scene and embraced a more comedic side.